One day there was a boy called Logan, who was in 4th class. He was 9 years old. After school his mom put down his dinner – but there were potatoes on it! So Logan screamed: “Ahhhhhhhhh” and ran out the door. “Logan, are you afraid of potatoes?” his mom asked. “Yes. They are born from the depths of eeevvillll” he answered. 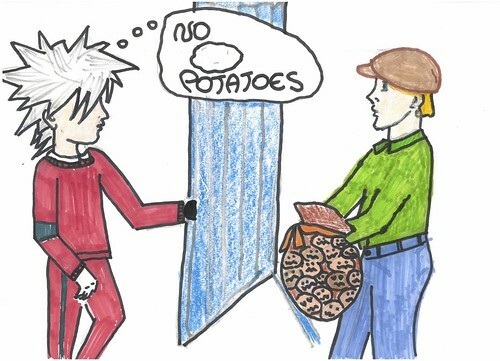 Then Logan’s phone buzzed, and he saw that mutant evil potatoes, with chip crossbows, were attacking Po-ta-toville. When he scrolled down he saw a picture of a big bowl of potatoes, and he remembered he had to feed his pet penguin. “Dude, I’m hungry!” Jeffi said as Logan walked in.